Splice: The Official Blog of MeetingMatrix® International: Don’t Worry. Be Happy. It’s that feeling you have when the birthday presents are stacked in front of you, ready to open. The carefree sensation that rolls through your body when the kid next to you is pummeled with a high pressure stream from your Super Soaker during afternoon water wars. Or, excitement and adrenaline produced by playing back to back basketball pickup games with your friends all summer long. Do you often feel stress-free? How about at work? Let me take a guess: I would say that you are at least two coffees in - staring down at the clock wishing the day was over. Let me paint a picture of an all-too-familiar sight: Mr. and Mrs. Smith racing off to work in their vehicles of choice. They are taking shortcuts, sailing through yellowish-red lights, and drafting other commuters to ensure a speedy pass. All this is done while ingesting enough caffeine to fuel the morning madness that takes place in their congested cubicle. Take away the 9-5 workday guidelines. Erase vacation, personal days, and the 5 day workweek mentality. Store your business attire in the attic. Fire the sitter. Task Inspired Management Environment (T.I.M.E.) is the cure for the common workplace. As stated in the T.I.M.E. guidelines “Work isn’t a place you go – it’s something you do. Nobody should feel guilty, overworked, or stressed-out as a result of their job.” Imagine that. When it was first implemented in the spring of 2009, no one knew if this new idea of the workplace was going to succeed. Would anyone ever show up for work? Could you be in Maui and still live up to the expectations set by your peers? How many days could one take off consecutively? Sure enough, work continued to be accomplished. In fact, productivity has hit an all-time high. Most of the key components to the concept that has made T.I.M.E. successful involve self management or individual responsibility. After all, who knows you better than…well, you? This all sounds too good to be true. But T.I.M.E. is real and has recently gained the title of “Award Winning” to back up its legitimacy. 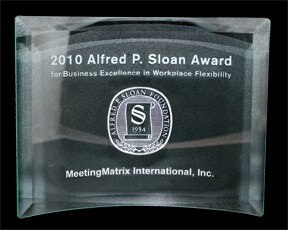 MeetingMatrix International was awarded the 2010 Alfred P. Sloan Award for Business Excellence in Workplace Flexibility. The award recognizes various types and sizes of businesses that use workplace flexibility as a tool to enhance employee and business success. Applicants must rank in the top 20% of the U.S. employers in terms of their programs and practices for creating effective and flexible workplaces, based on nationally representative data from Families and Work Institute. To top it off, two thirds of the overall score is derived from a confidential employee survey ensuring the program is positively effecting the entire organization. I can personally attest to the value that T.I.M.E. has brought to our workplace. The quality of work and atmosphere in the office has improved exponentially. I think employee surveys is the best tool for understanding the organizational problem. Employee surveys ensure that the workforce is positively effecting the entire organization.